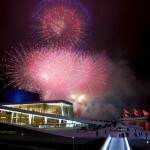 Oslo’s new Opera House opened on 12 April 2008 and it was designed by the famous Norwegian company Snøhetta. This company has also designed the Library of Alexandria in Egypt and the National September 11th Memorial Museum Pavilion/Cultural Complex at the World Trade Center site in New York. The Opera has three stages and they can in total seat around 2000 people. 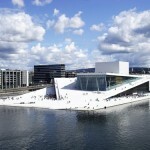 The Opera has a beautiful location down by the Oslofjord, so be sure to make a picture or ten of this as you visit Oslo.